Fear is a double edged sword. Thinking of fear this way will allow you to overcome your fear. 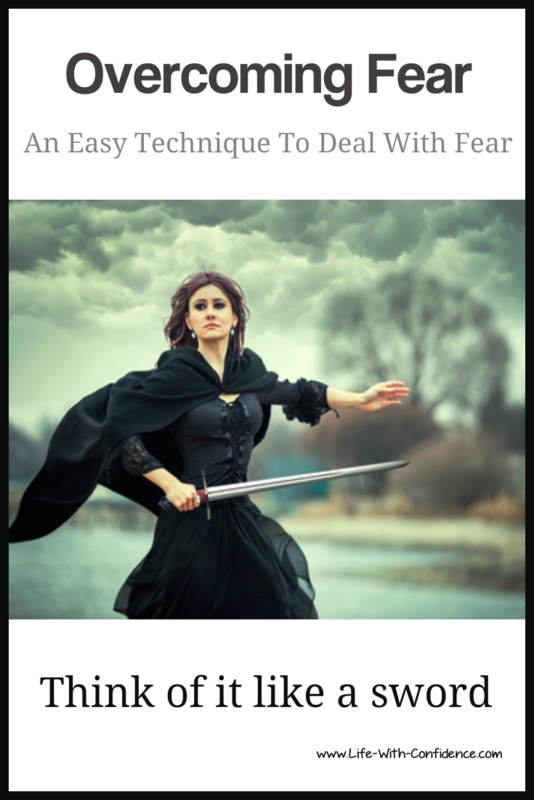 You'll also be able to deal with fear with a simple technique by keeping the image of the sword in your mind. Before we talk about the technique, let's take a quick look at fear. With fear, there's a constructive side and a destructive side associated with it. Being aware of the two sides means you can then choose to use your fear in a positive way instead of becoming paralyzed into inaction. On the constructive side, fear keeps you safe and out of danger. You're not going to run across a busy highway because you're afraid of getting run over. This is good. On the other hand, there can also be a much darker side of fear which can completely consume your thoughts. With this type of fear, you end up becoming panicked, frightened, and freeze in place. Allowing this side of fear to overwhelm your thoughts will mean you'll end up never living life to your true potential and all because you've let fear stop you. This is the fear you're probably wanting to overcome right now. When you become panicked with fear and freeze into inaction, you've used the wrong side of the sword. Another part of using the wrong side of the sword is letting fear consume your thoughts so much that you start to doubt yourself. You doubt that you can do it, you doubt that you're worthy of doing it, and you start to feel powerless to make changes in your life. You feel like you just can't do it. You feel frustrated before you've even taken any action. 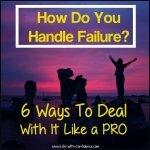 You may feel so frustrated that you even give up before you start and this is all because you've taken hold of the destructive side of fear instead of the constructive side. Letting fear stop you from living your life is a true tragedy. It doesn't have to happen to you if you learn how to overcome fear in a positive way. So, how do you overcome fear? What's the best way to approach those things that make you fearful? The first part to know about fear is that it's a natural part of life. And, there's no escaping that you’re going to experience fear at certain times in your life. You're not alone in this. Everyone feels fear. The trick is to not fear that feeling of fear and also not try to always avoid feeling fear. A lot of people will get trapped living in their comfort zones because they find the feeling of fear so distressing. But, it's okay to be scared or unsure or frightened. It's how you react to these feelings that's important. And, the more you're aware of your feelings, the more in control you'll feel. Feeling like you're not in control is one of the reasons why some people want to avoid ever feeling fear. If you simply allow yourself to become aware that you're feeling fear thoughts, it will start to lose power over your thoughts. You'll be able to say, "Yes, I'm feeling fear right now," and then move on to allowing yourself to go back to thinking about your goal. You know the fear is there but it's not the overriding thought anymore. 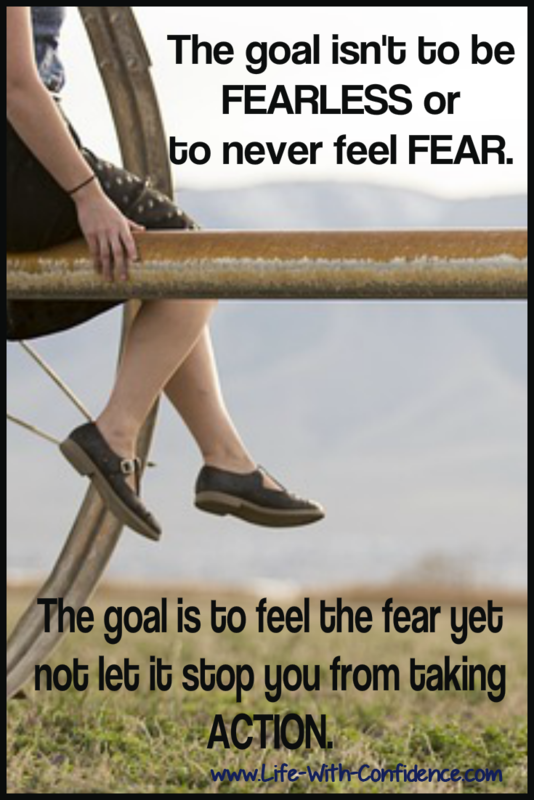 So, this is an important point, the goal isn’t to be fearless or to never feel fear. The goal is to experience the fear yet not let it stop you from taking action. I'm sure you've seen all those slogans that say, "Be Fearless" or "No Fear" which are supposed to motivate you to leap over buildings in a single bound like Superman. But, that's not realistic. And, by denying your fear, you're missing out on a valuable tool. It's far better to acknowledge your fear and work with it rather than just trying to deny it or overpower it with sheer force of will. Elizabeth Gilbert, the author of Eat, Pray, Love has some great advice in her Creativity Workshop on udemy.com about coming to terms with your fear. She suggests instead of wanting to be fearless, think of yourself as having courage. She also suggests imagining telling your fear to go and sit in the corner. Then thank your fear for keeping you safe and let it know that you don’t need it right now. It's good advice because you become aware that yes, you do have fear but you've thought about this and you still think it's a good idea to move forwards. By visualizing that fear and acknowledging it, it can no longer continue to percolate in the back of your mind causing you to doubt yourself. Know that fear doesn’t mean you shouldn’t go ahead and take action. It might be a sign that you might need slightly more information before proceeding or simply to be cautious about moving forwards. Or another common reason you might be feeling fear is simply because you don't know what to expect. There are unknowns associated with going after your goal. You don't know how it will turn out and this can be frightening. It can feel easier to stick with what you know rather than risk the unknown. If this is the case, identify the feeling that you're afraid of the unknown and this will allow you to work towards gaining more needed information. Or perhaps you simply need to allow yourself to be okay with feeling slightly apprehensive about the unknown. Know that you'll be fine. You can deal with whatever comes up. To help with believing this, let's move on to a list you can make for yourself. One way to deal with fear is to make a list of the risks in making your desired change. For example, if you change jobs, what are the risks? One might be that you’ll lose the friendship of your current coworkers. Another might be that you won’t like the work environment of the new job location. Or if you really let your fears go wild, maybe you won't be able to do the new job and you'll end up being fired. Or, more realistically, there might be more travel involved and you might fear that you won't see your family as much. So, go ahead. Write down all the risks you can think of which "might" occur if you choose that option. At this point, it's also good to remind yourself that usually your fears don't come true. You just worry that they "might" happen. Also, just getting them out of your head and on to the paper will help dispel a number of your fears. Often simply bringing a fear to the light of day will make it lose its power over you. Won’t be advancing my career. Will continue to be bored at current job. Will continue with low pay. Will be stuck with long commute every day. Now, you have a clearer picture of what you have to lose if you don't acknowledge your fear and let yourself become paralyzed into inaction. Not taking action is just as much of a decision as is choosing to take action. By making the two lists, you're able to make a more informed decision. It will make it clearer in your mind that you may lose far more by not taking the risk than if you face your fears and move forwards. You'll realize it's worth focusing on what you want to achieve rather than the fears which might or might not happen. The fears can be overcome. They don't need to keep you trapped in a situation you no longer want to be in. Molly Gordon has a great article where she explains that there's two different types of fear. Fear 1 is the one I'm sure you're most familiar with which is that it paralyzes you into inaction. As Molly says, " Fear 1 magnifies danger and vulnerability while minimizing your sense of competence". So, this is the fear we want to convert into Fear 2. This is the fear that will take all your anxious and nervous energy and focus that into defined action steps that will lead you towards achieving your goals. Molly describes it as, "Fear 2 mobilizes your whole being for effective action. It includes a series of marvelous physiological changes that prepare the body for peak performance. Fear 2 focuses attention, provides adrenaline for extraordinary effort, and sharpens perception. Fear 2 promotes effective action." Yes! That's the kind of fear you want. The one that takes hold of and propels you towards success. That's the side of the sword you want to visualize using when you're ready to take on whatever comes your way. You're strong, you're a warrior, and you can see your desired prize in your sights. When you can convert Fear 1 into Fear 2, you've gained a tool which helps you rather than hinders you. The way you convert Fear 1 into Fear 2 is by taking the time to assess the situation and analyse what's a real fear and what's not but also what actions can you take. You also need to make the decision as to whether you're willing to accept the risk. So, if we go back to the previous example of wanting to change jobs, you'd look at the fears you have and see if they're real or not. You'd then consider if there are any actions you could take to mitigate the risks. And finally, you'd ask yourself, "Am I willing to accept that risk?" One of the fears was that you might lose the friendship of your co-workers. Is that a real fear? Yes, you might. Are there actions you could take? Yes, you could make the extra effort to keep in contact with them by going to lunch with them or setting up some other activity. You could also remind yourself that you'll probably make new friends at your new job. And, the final step is to decide whether the gains of your goal is worth the risk, in this case losing those friends. Is getting a new job, where you might make even better friends, plus feel much more fulfilled and gaining new skills, worth the risk of losing the friendship of your current co-workers? That's a decision only you can make but hopefully once you've done your analysis you would see that what you have to gain is worth having to face your fear. One of the worst parts of the destructive fear is that you get into a loop of worrying about what you might lose and you totally forget about what you'll gain. So, remind yourself why you're wanting to go after the goal in the first place. Focus on what you'll gain when you're successful. Most likely, what you gain will completely overshadow what you "might" lose. 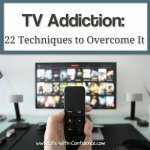 So, let's recap everything you've learned so far in how to overcome your fears. First, accept that fear is a natural and normal emotion that everyone feels. Feeling fear can also be a good sign that you're pushing back the boundaries of your comfort zone and are ready to try something new and exciting even though it might feel fearful at first because you don't know what to expect. Next, assess your fears. Write them down and also make a list of what you'll lose if you don't face your fears. Make an informed decision instead of becoming paralyzed by fear. It'll take a little practice to get into the routine of doing this but after you've done it a few times, you'll start to do it automatically. The trick is to become aware when you've slipped into that panicked, frozen in place stage of fear. As soon as you realize you're paralysed into inaction, take a deep breathe, identify that you're feeling fear, and now you've started the process to gaining balance between your logical side and your emotional overwhelmed with fear side. And, finally, think of your fears like a sword which you can use to slay your demons and your doubts. Use your fear to focus your concentration and efforts in such a way that you slash your way towards success. Fear, a double-edged sword, choose your side wisely.